PowerAI Vision makes computer vision with deep learning more accessible to business users. 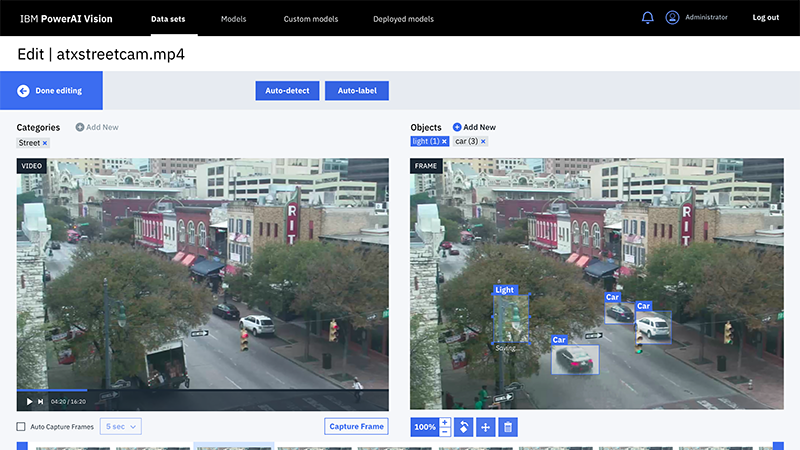 PowerAI Vision includes an intuitive toolset that empowers subject matter experts to label, train, and deploy deep learning vision models, without coding or deep learning expertise. It includes the most popular deep learning frameworks and their dependencies, and it is built for easy and rapid deployment and increased team productivity. By combining PowerAI Vision software with accelerated IBM® Power Systems™, enterprises can rapidly deploy a fully optimized and supported platform with blazing performance. Interface streamlines process for domain experts to bring data and train models. Subject matter experts across industries can now build models for AI solutions with limited deep learning skills. Iteratively train deep learning models and automatically label videos to create volumes of accurate data sets for training. Engage compute-intensive IBM Power Systems to train and then export the trained models and deploy them on-premise, in the cloud or on edge devices. Import your custom models in TensorFlow so your data scientists no longer need to train, tune or deploy them. IBM PowerAI Vision was designed to unleash AI performance capabilities of IBM Power Systems and leverages IBM Research performance breakthroughs. Deploy with confidence in the cloud, knowing the entire software-hardware stack has been tested and validated. Use it for a week, month, or longer term saving you thousands of dollars in associated TCO costs. IBM and Cirrascale Cloud Services have partnered together to enable customers across all industries to harness the full potential of AI in their businesses. With IBM PowerAI Vision, data scientists and subject matter experts can label, train, and deploy deep learning vision models, without coding or deep learning expertise. If you would like to see if you qualify for this free 7-day trial to test PowerAI Vision on IBM Power, complete the form to the right and we'll touch base with you within 48 hours to schedule you for your test drive. Systems are limited, so it is first come, first served, but we'll do everything we can to help you get started quickly.